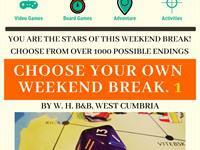 A fantastic, geeky, all-inclusive weekend break - filled with activities, food and fun – where you are the stars of the adventure! We provide the accommodation, food, and make all the arrangements so that you can focus on enjoying your weekend away. Once we know what activities you would like and any specific requests, then we will work our socks off to craft the perfect adventure for your group! There’s space for several activities, including one special ticketed activity, and you just let us know which one sounds best for your group! Planning a birthday party, hen do, stag party, team-building weekend, or other special occasion? Just let us know so we can tailor your weekend to your needs and make the experience perfect! 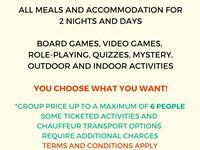 Two nights of activities, food, drinks, accommodation and fun for up to 6 people! There’s a heap of activities included in the price (see the section below for more details) plus some premium options if you want to kick the adventure up a notch. You get loads of options for the ticketed activities, and plenty of other activities which can be led by your hosts – or we can just provide some resources and let you go wild! Cooked breakfasts, lunches and evening meals – including a Sunday carvery lunch as well as snacks and soft drinks - are included in the price. You will have 4 en-suite rooms with flat-screen TVs and free wi-fi, plus exclusive use of the property for the weekend! You just need to show up and enjoy your weekend break! What Activities Can We Choose? Absolutely loads - with many options offering customisable elements to truly make the weekend your own! There are 15 options for ticketed activities with a further 9 included activity options which you can schedule across the weekend. Some of the ticketed options require an additional charge, which are listed as either “deluxe” or “premium” in the table below. Additionally, many of the options can be customised, and led by your hosts, or we can provide resources for you to have fun on your own! You can find all the forms to book, plus downloadable copies of our promotion materials, in the following Google Drive folder. 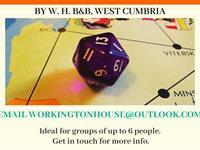 Just send us the completed forms by email (workingtonhouse@outlook.com) and we will be in touch within 48 hours to confirm your booking and take a small deposit – which will be used to book your chosen ticketed activities and transport (if selected). 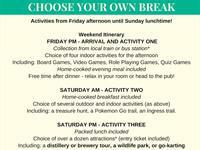 We’ll also find out any custom options you want to make sure your weekend is just perfect for your group. If we cannot accommodate your chosen date or ticketed activity, we will be in touch to offer alternatives, or we will return your deposit in full. If you have any questions at all about the weekend break or the booking process, then please don’t hesitate to email us (workingtonhouse@outlook.com) or give us a call on 07775 312 882. Our introductory price won’t last for long, so make sure you book soon to secure your perfect weekend away! The full T&Cs for the weekend break can be found in the Google Drive folder, and you can learn more about the available options by taking a look at the other documents. We can be very flexible in terms of the schedule, customised options, and what you would like to do across the weekend. We cater to almost any dietary requirements with prior notice and will make sure we have a good selection of snacks and soft drinks available during your stay. Please note: We are not licensed to provide alcohol but you are welcome to bring your own. Again, if you have any questions at all about the weekend break or the booking process, then please don’t hesitate to email us (workingtonhouse@outlook.com).